One of the most interesting and emblematic buildings in Fuerteventura, with a great historical meaning as much for this majorera island as for the whole Canary Archipelago, is the colonels’ house; a feudal building, located in the malpaís of ‘La Arena’, in the outskirts of La Oliva, standing out not just because of its history but because of its architecture too. It is a civic and military building that started to be built in the second half of the XVII Century, ruled by the Sánchez-Dumpiérrez family, and it surprises us because of its great dimensions, making a contrast with the desert landscape and the plains where it is located. The Sánchez-Dumpiérrez Family held repeatedly the office of Colonel of the Provincial Militias, which was held for life and it was hereditary. They created a military aristocracy extremely mighty, and they would dominate the island at the end of the XVIII century. Why does the figure of the colonel have so much power in comparison to that of feudal lords? Once that Fuerteventura takes part in the Catillian Crown dominions are established, and the family Arias de Saavedra held the title of Fuerteventura’s lords. The crown is aware that their power to control their own territories is weakening, as the lands are under the rule of lords that govern their own way. So, the crown decides to create a military regiment under the rule of a colonel that would take control of the island little by little. 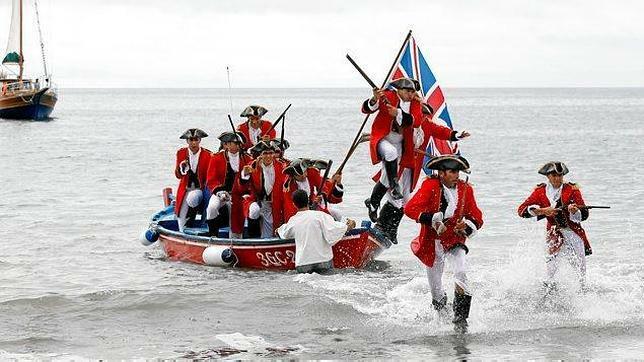 In 1708 the militia’s regiment is settled, and their colonel holds the office and duties of ‘Governador de Armas’; the mission of this office will be to undermine the power of the island’s lords. First of all they take away their military power, and little by little colonels become the true landowners, ruling the island from their fortress houses: the colonels’ house. 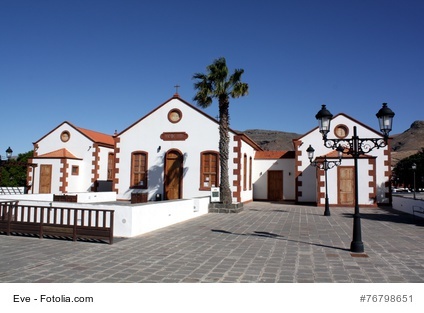 Fuerteventura’s lords lived in Betancuria, but colonels settle in La Oliva, so Betancuria loses interest, and political, economic and social development starts in La Oliva, living at that time its biggest splendour. La Oliva becomes thus the most important major city in Fuerteventura; the colonel orders the building of La Oliva’s church (the biggest one in the island) and creates and important market; the first colonel even buys the sculpture of the ‘Virgen de la Candelaria’, thus undermining that of the ‘Virgen de Betancuria’. They became the richest family in the Canary Islands. The power the colonels got was so great that they started to live as proper lords- there was a splendorous social and artistic refinement. Among the payslips found in the house there was that of a pianist brought from France, which shows the refinement and artistic sensitivity they had. Painters of a great reputation went to this house and gave expression to portraits of La Oliva’s colonels. The architectural complex of the Colonels’ house clearly shows the power that this family enjoyed. It is a building inspired in the rustic houses of nobility in the Canary Islands (like those that at that time were built in Tenerife’s Lagoon, but improved). It was made of several areas or buildings, each one with a different function: the main square, the cistern, the stables, the ceremony area, the agricultural area…. Within this complex you also find the doctor’s house, the chemistry, the administrator’s area, the carpenter’s workshop, the blacksmith’s… and in the central area, as a powerful castle, the building where the colonel and his family lived. Colonels get their full splendor in the XVIII C, but all through the XIX C. the new economic, political and social situations bring the military power in Fuerteventura to a slow deterioration. Populations like Puerto de Cabras and Antigua gain importance as demographic segments. Colonels will lose their political and military power, not the economic one though, which they will keep even after the colonles’ office disappeared. 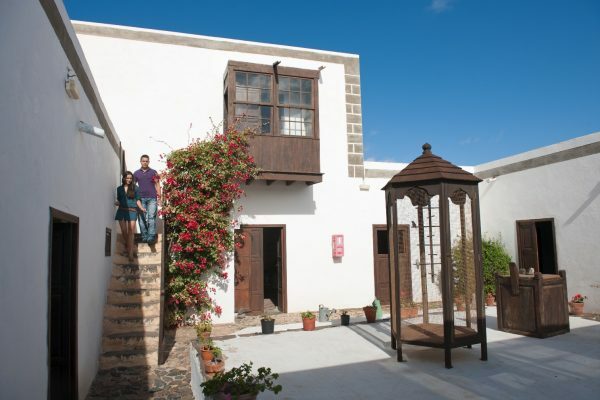 Nowadays The Colonels’ house is a museum that hints at the power that Fuerteventura held in the past. FUERTEVENTURA HISTORY. A WALL, TWO TRIBES, TWO KINGS. 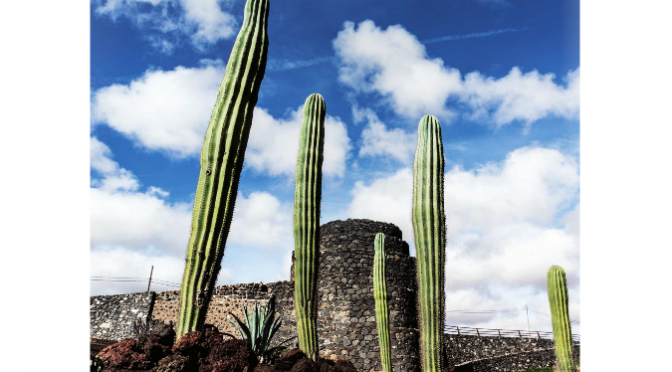 The truth about the primitive Fuerteventura’s inhabitants is a great mistery, difficult to clarify due to the lack of archeological, historic and linguistic evidences; but still there are several research trends that stand for different theories. Some authors call the island «Maxorata», named after the biggest of the kingdoms the island was divided into; however there is a place name –recorded by Norman authors- our focus in order to approach the age of the ancient prehistoric kingdoms in Fuerteventura. This place name is «Erbania» or «Herbania», and a research trend relates this name to «Arbani» -the place where the wall is-. 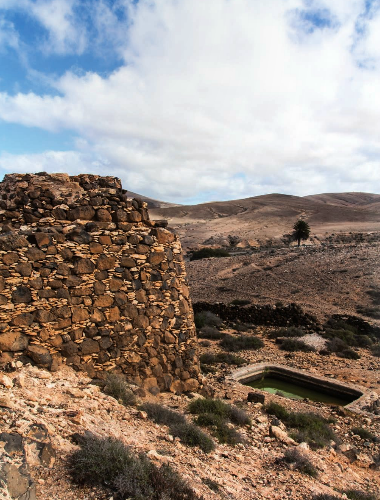 It makes reference to the wall, made of dry stone, which divided the island of Fuerteventura into two parts, near Jandia’s isthmus, a wall of which there are still some remains nowadays. On the basis of this research trend and of some other data that was recorded we can try to get a picture of what the firsts inhabitants of this island were like. The island was divided into two tribes or kingdoms, ruled by two kings. Each of them had their own descendants’ groups, related among themselves or through economic or marital exchanges; this way they created a bipolar tribal society characterized by hostile relations among themselves, and known as dual system. The need of a greater amount of pastures and the fight for more and more limited resources would take kinship groups to look for higher politic organizations to cope with the military confrontation towards the other tribe, genealogically more distant. Despite hostility between the two kingdoms, this was not permanent, as both tribes had a feeling of belonging to the same ethnic group, which they showed when they cooperated against a foreign enemy (the Normans) or when they adopted a pacific relationship in festivities and rituals that were common to the whole population in Fuerteventura. Majorero kings must be considered as leaders or military chiefs, outstanding because of their warlike qualities. Their promotion was due to the lengthy military confrontations among the tribes, and to the need of organizing the defense against European incursions during the XIV and XV centuries. Those pastoral tribes had an aggressive nature and their military confrontations were very common, usually having to do with livestock and pastures. Normans always talk about them as ferocious warriors, with a good aim but without armour, with poor gadgets such as stones and wooden spears with no iron, similar to the ones existing in the rest of the archipelago. The last aboriginal kings we have records about are Guize (to the North of the Wall) and Ayoze (to the South) and the two existing regions would be named after them. As we said before, other research trends reject this theory because of the difference about the areas of these regions, the Northern one being much wider than the Southern one, though despite this difference both areas were very close in resources. Until here we have tried an approach to the aborigine and fist inhabitants of this part of «La Macaronesia». 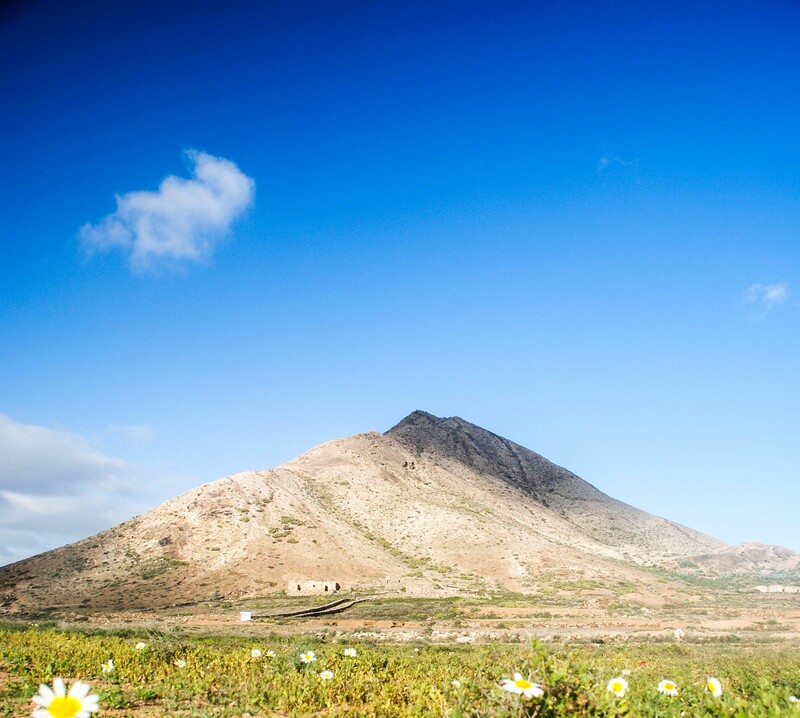 They are several the natural monuments in Fuerteventura —Isla de Lobos is one of them, this is why we enjoy taking tourists to such a setting in our daily excursions— ; one of them, and which we consider a place where memory and magic find shelter is Tindaya Mountain. To the ancient inhabitants of the island (Los Mahos) this is a Sacred Mountain, one of the most important natural monuments in The Canary Islands. Located 4 kms from the coast, in the ravine of Esquinzo, in the village of Tindaya (municipality of La Oliva), this mountain, 400m above sea level, is a spectacular trachyta python that erosion, over time, has exposed as the volcano that wrapped it wore down and showed it. The trachyte is a hard and rough volcanic rock that once was used to make millstones and is now a highly valued ornamental stone used for building and once polished it recalls marble. Geomorphologically, its study is essential to understand the formation of The Canary Islands. 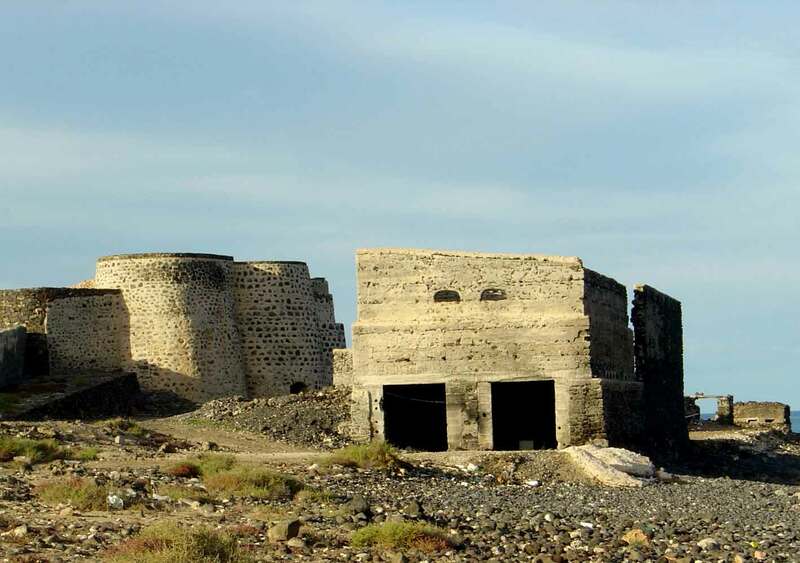 Tindaya has very important cultural, historical and ecological values. Popularly known as the Witches’ mountain, it contains nearly 300 “podomorfos” footprints (foot-shaped engravings), which turn the mountain into one of the largest engraving sites in the planet, similar to those found in North Africa. These foot-shaped engravings were made by different hands at different times, as there are several kinds, in size, execution and distribution. They are spread over more than fifty panels grouped in its upper section and almost thirty loose figures, missing today. We do not know much about these “podomorfos”, all of them oriented towards the sunset, the west; some believe this is because from the top of this mountain, on clear days, you can see Teide Mountain, which ancient inhabitants considered to be Satan’s residence and it might be the target of their rituals, although there are other more plausible theories which relate these footprints with astrological phenomena and Summer and Winter solstices. Other theories speak of nuptial rites … What is undeniable is that this mountain was a ritual site for ancient inhabitants and, therefore, a sacred mountain. At the foot of this mountain 3 permanent settlements with aboriginal remains have been found, research issues still open, remains of cabins or homes, polished shells and carefully crafted pottery, which seems to belong to rituals rather than to household goods. The oral history or Tindaya tells that games, dances and magical-religious rituals, linked to the stars and supernatural forces, were held there. Plant and animal species shelter. 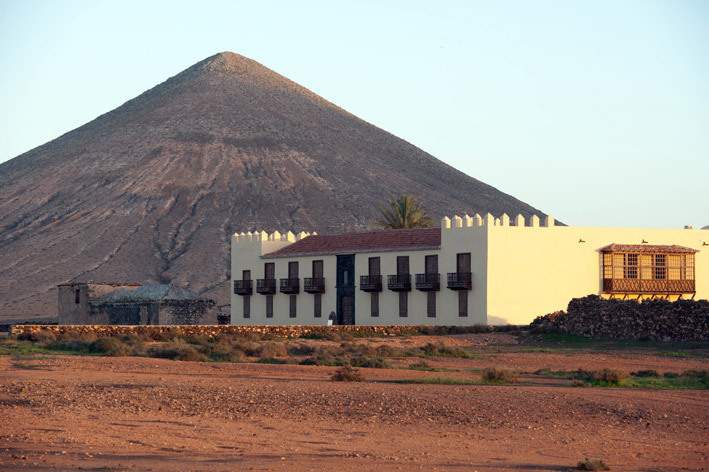 The sacred mountain of Tindaya is also shelter for endemic species, many of them unique to Fuerteventura and some, endangered. We’ll highlight “La Chumberilla de Lobos” or “Cernúa” (Caralluma Burchardii). It also serves as a shelter for animals, many of them species in clear decline, classified as rare and uncommon now, as it is the case of the Canary Island Stonechat and the Trumpeter Finch. Natural Area of ​​National Interest. For all these values, this area was declared, by 12/1987 Law, of June 19th , on Declaration of Canary Island Natural Areas, as “Paraje Natural de Interés Nacional de Montaña Tindaya” and reclassified as natural monument by 12/1994 Law, of December 19th, on Natural Areas of the Canary Islands. Tindaya is culture, history, magic and nature; it is a natural monument worthy of respect and research to clarify the past of this land, that of the ancient inhabitants of this corner of La Macaronesian who, like us, felt the magnetism that turns it into the Witches’ Mountain, one of the most beautiful living monuments in the Canary Islands. 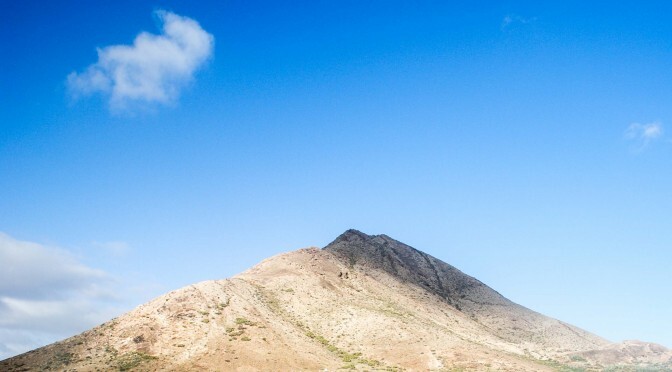 Climbing this mountain is now banned but you can stroll around to feel its majesty, also visible from different areas in northern Fuerteventura and recognizable for its special rock, different from other mountains or volcanoes on the island. They are already several the recommendations of must spots to visit and discover in this island; our favourite one will always be the tour around Isla de Lobos in one of our daily excursions from Corralejo; it is so recommendable that we are number one on TripAdvisor so, will you miss it? Just at a glance at Fuerteventura or Isla de Lobos, at their strange shapes, majestic cliffs eroded by the strength of the Atlantic, volcanoes that despite the passage of time still show us their craters, the wonderful “malpaís” that covers a great part of this land, … you can perceive the volcanic past of these islands. A history of strong eruptions that have reached our days offering us a different and spectacular landscape worthy of admiration. Fuerteventura island is the oldest one in the Canary Islands. 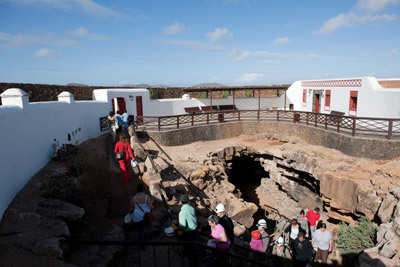 In order to know many secrets of the past of this island we can visit “La Cueva del Llano”, a centre that allows us to delve into the depths of the earth, letting us know which animals inhabited the island thousands of years ago. What is “La Cueva del Llano”? 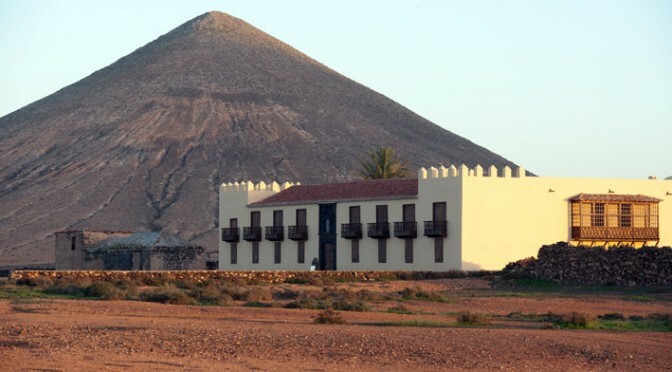 It is a paleontological site located in the town of Villaverde, municipality of La Oliva, about 8 kilometres from Corralejo (headquarters for our excursions to Isla de Lobos) that was formed by the eruption of the mountain of Escanfraga 800.000 years ago. The eruption of this volcano caused a river of lava flows that solidified at the top by contact with air, while the bottom remained smooth, descending to the sea. Once this eruption was complete the result was an empty tunnel which forms a volcanic pipe which is up to 12 meters wide and up to 5 metres high at the highest parts, it even reaches 7 metres at some point. The surveyed length so far is 648 meters though the last 200 are difficult to scan. This lava tube is an open book on the past of this land as “La Cueva” has worked as a drain of water in the area; due to the collapse of part of its roof, “El Jameo” was formed, which gives access to it and through which streams of water and mud have slipped for centuries, sweeping sediments of the different stages and remains of fossilized animals which still remain there. Its walls, despite the passage of time, still retain the traces of this mud; as a result, the scientific community has bioclimatic samples to investigate the past of this island. “La Cueva del Llano” is today an interpretation centre whose visit allows us to dive deeper into this lava tube tunnel walking a few meters, a guided tour on the soils of this island, where you will discover its richness. 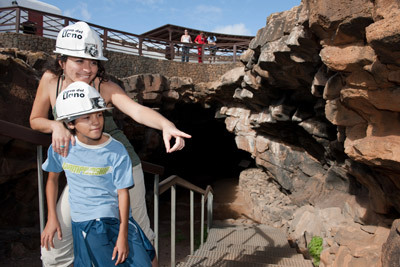 Before diving into the depths of the cave, visitors can discover the geological variety of Fuerteventura in the interpretation centre. This tube has an inhabitant of exception: the harvestman arachnid (Maiorerus randoi), similar to the spider, but yellowish, and unique to “La Cueva del Llano”, being the only cavity in Fuerteventura with appropriate environmental conditions; this is one of the most extraordinary species of invertebrate in the fauna of The Canary Islands. It is a small arachnid adapted to living in the darkness of the cave, so it is almost transparent as it has lost pigmentation and sight due to the darkness; therefore it uses two front legs as sticks to feel its way. It is believed that the ancestors of this arachnid arrived in the Canary Islands in wetter times, millions of years ago, living on the surface, and due to climate change it sought refuge in the cave where it found an ideal habitat. This Interpretation Centre is a monument of nature. 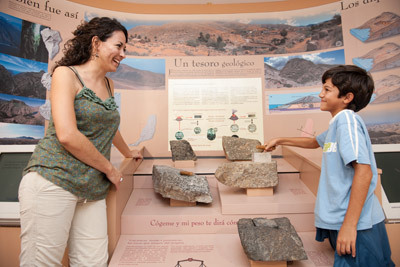 An exceptional place to know and understand the evolution of the climate in Fuerteventura. 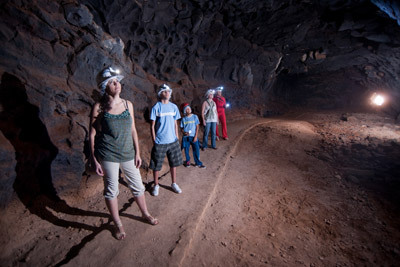 It is also the oldest lava tube in the Canary Islands and probably one of the best preserved. Today it reopens Wednesday and Thursday, 10-15 hours. Saturdays from 15-18 hours to delight those who want to know more about the majestic volcanic past of these islands. Therefore besides recommending the visit to Isla de Lobos on one of our trips from Corralejo, to enjoy the beauty of this volcanic landscape that Lobos preserves even dramatically wild and natural, we recommend visiting the depths of Fuerteventura to understand and learn first hand the history of these islands. 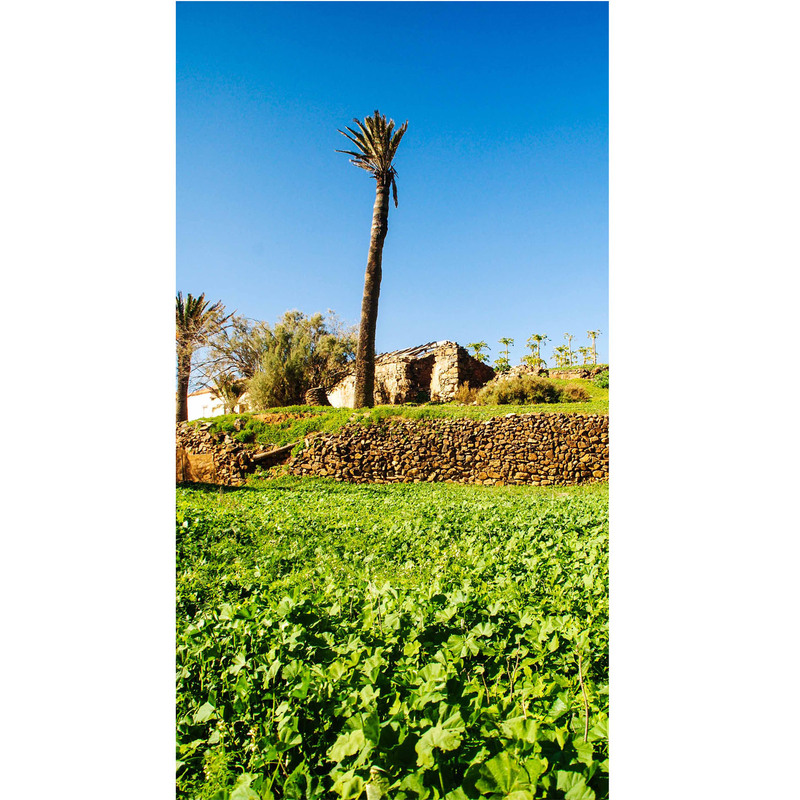 During the XVII, XVIII and XIX centuries, one of the activities that moved the economic outlook in the history of Fuerteventura, providing a means to make a living for many families, was the export of lime to Gran Canaria, Tenerife and La Palma. Therefore, today we can find many different kinds of lime kilns. Some of the 300 that are estimated to have existed in the island have been restored, but by 1970 cement replaced this material, doing away with the office of the lime merchants, which began on the island around 1641. Initially vessels that collected lime to export to the other islands anchored in ports such as El Cotillo, Caleta de Fuste and Ajuy, where there was no dock; then the loading of ships was very laborious, as lime cannot get wet, because if it does its volume increases up to 50%. It had to be carefully transported by barge to the ships that once loaded journeyed to their destination, praying for the lime not to get wet, since an increase in volume could make the ship burst. When it was discovered that the bay of Puerto del Rosario was much better, all activity moved to the capital, it turning, in the first half of the twentieth century, into “Puerto de la Cal”, where a number of industrial sites were built, which employed a large part of the population of the time. In the first 10 years of the twentieth century 70,000 tons of lime were exported. “Caleras” or domestic wood kilns: they predominated in the villages of the interior. Gorse, tamarisks and “matos” were used as fuel. They had a low production capacity per batch and the obtained product was destined to internal or domestic consumption. These kilns used to be circular and their height did not exceed 4m. Coal-fired industrial boilers: also called continuous furnaces, due to their production without interruption. They had a great capacity for lime production. They are usually rectangular and can reach 8 to 12 m high. The ones in Hondura and “El Charco” in Puerto del Rosario stand out. We must make special mention of Ajuy kilns, which cannot be included in any of these kinds, as they were holes dug in the ground, about 12 m deep and 3m in diameter, built in a small cliff by the sea. The way to transport lime stone was with camels and donkeys in quarries baskets of about 10kg, and the tools used to extract them were: shovel, pick, hammer, wedge bar to pry the stone, “ el marrón”, to split the larger stone, and a mace, to split the small stone. Once limestone was carried to the kiln, they proceeded to fill it through the upper opening, a layer of rock interpersed with another one of fuel, until the kiln was completely full. The kiln was lit on the bottom, where there was another opening; dry and tight gorse were placed there, and then it was set fire. Thus, the fire reached the different layers of fuel, turning “caliche” into quicklime. The cooking process of lime could take several days, even one week. The process ended when the colour of the smoke became white. Lime was removed from the kiln from the bottom, moving or hitting the iron grid on which the stones, now transformed into lime, had lain and were now shredded at the bottom of the kiln. Water was added to the limestone or quicklime after the end of its cooking, thus obtaining the so-called slaked lime (calcium hydroxide). This lime was ready to be loaded and transported. Lime kilns in Lobos island. In our neighboring Lobos Island, where we go on our daily boat trips, there were 4 lime kilns, 3 out of which have been preseverd : Atalaya Grande, Las Lagunitas and Calera Kiln. They are located in areas close to the coast, where there are organic limestone formations, coming from shells and skeletal remains of marine animals. Therefore, the lime that was obtained in the islet was “albeo” lime, used to whiten walls. In our daily trips to the island of Lobos we tell our visitors about the Fuerteventura’s history so that apart from living an unpaired marine experience, they leave our island with some more knowledge about it. In our eagerness to make the wonders of this paradise, Fuerteventura, known we can not ignore the oldest town in this island, and although our main passions are the sea and the boat trips around here, we recommend a visit to this town in the central area of the island: Betancuria. Let’s get closer to the history of this island and specifically to this town, going back to the years of the conquest. 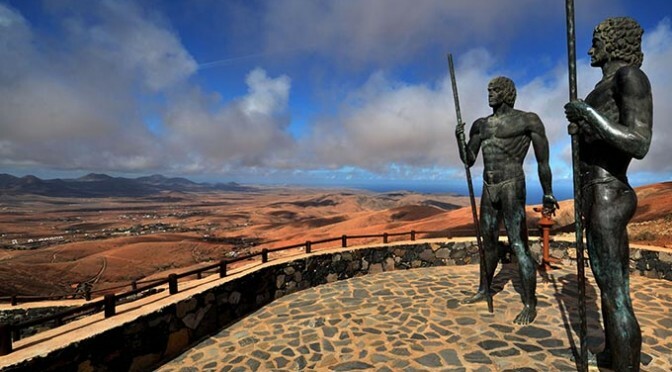 In 1402 Fuerteventura was invaded by the French nobleman Jean de Bethencourt (Norman from origin, he got in touch with the Castilian crown through a relative and he got the right to conquer the islands). However it wasn’t until two years later that Fuerteventura was finally conquered. In 1404 colonization starts properly; with this purpose a capital was founded by the military man Gadifer de la Salle —who accompanied Jean de Bethencourt in the conquest— and by Bethencourt himself, whose figure would be honoured when the capital was named after him: Betancuria, placed in one of the most fertile areas inland —a green valley, sheltered from the winds— less vulnerable and more sheltered from the frequent pirate attacks the island’s coasts used to suffer. This place had been one of the first settlements in this island, when their inhabitants were the Guanches. From its foundation it became a capital and the governing centre of this island, and all the administrative and governing organisms of this island were historically settled there. Betancuria kept its political and administrative importance for centuries, resisting several attempts of Berber invasions that devastated the capital in the middle of the XVI C. However, at the beginning of the XIX C its economical power was decreasing in favour of other populations that were quickly growing, such was the case of La Oliva and Pájara, until it became one of the less populated urban areas in Fuerteventura. At the beginning of the XVIII C the military government moves to La Oliva, which meant the beginning of the end of the political monopoly that Betancuria enjoyed. But it wasn’t until the XIX C that economical, social, administrative, religious and political changes —due to the fall of the Old Regime and the economic boom of the eastern side of the island— weaken Betancuria’s power in favour of other urban centres like Pájara, La Oliva, Antigua or Puerto de Cabras (Puerto del Rosario nowadays). 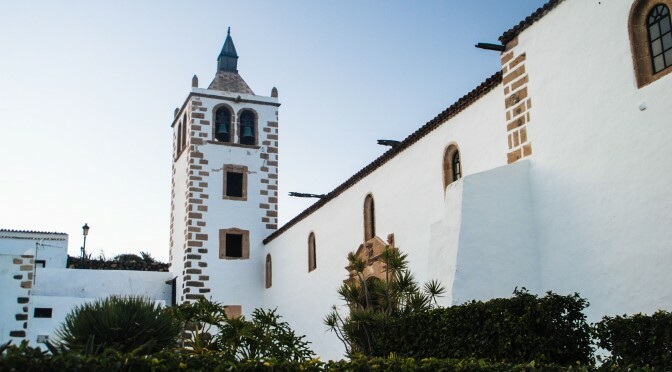 Betancuria stopped being the only parish in the island (XVIII C) when those of Nuestra Señora de Regla (Pájara) and Nuestra Señora de La Candelaria (La Oliva) were created. In 1834 the municipality of Puerto de Cabras is set up, independent from Tetir, and little by little the different institutions of the administration and the government get settled there, thus becoming the capital in 1860. 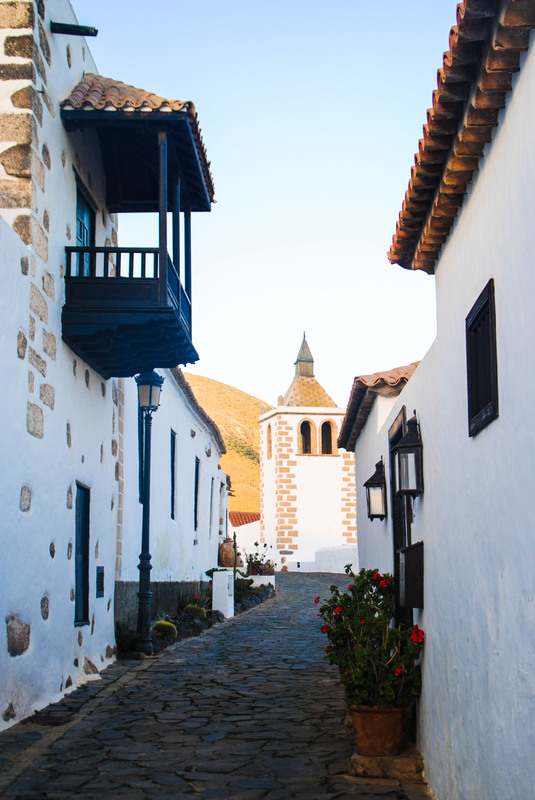 Nowadays Betancuria, with less than 700 inhabitants, is a touristic attraction because of its beauty, as it keeps being one of the most beautiful villages in this island, whose historical power is still reflected in some of its buildings. 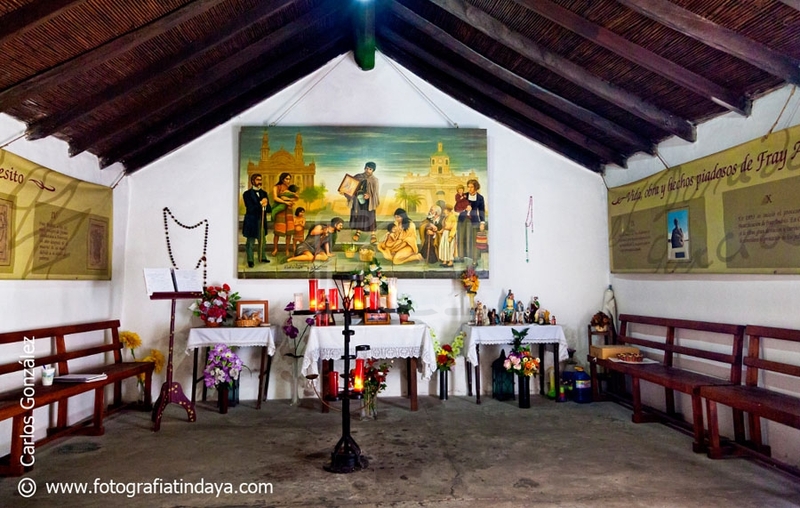 It’s one of the main buildings in this historical capital that started to be built during the first years of the founding of Betancuria to cover the spiritual needs of the islanders. 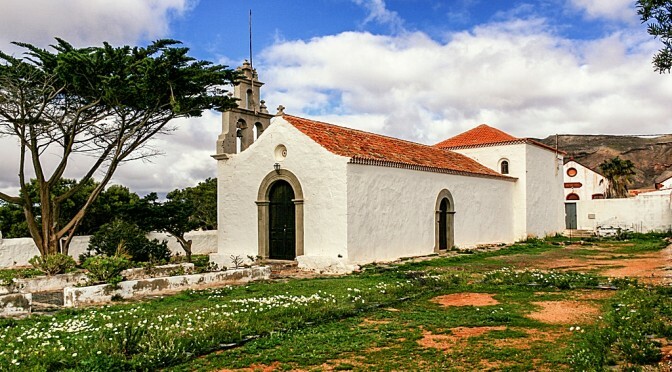 (The 10% of the agricultural production was given to the church, and the 20%, to the island’s governor). This Norman-gothic style Church-Cathedral suffered some Berber attacks and had to be rebuilt in the XVII C., though it still keeps some remains of the first church, like the belfry and some columns and, also worth mentioning, its baptistery, choir, and a Mudejar coffered ceiling. Another characteristic feature of Betancuria is its hermitage, similar —regarding the stone and the whitewashing— to the cathedral. Beside it we find the remains of the Franciscan convent that together with the hermitage were originally a part of the first Franciscan convent founded in the Canary Islands. The islet of Lobos — where we go almost everyday on our boat trips from Corralejo to show tourists the charms of its coasts and waters— is where the literary artist Josefina Plá was born, the 9th of November, 1903: she was the daughter of Leopoldo Plá, born to a family of natives from Alicante, and Rafaela Guerra Galvaní. Relating Josefina Plá to just one discipline is a hard task, as apart from being a poet, playwright, essayist, fiction writer and journalist she was also a well-known ceramicist, art critic and painter. She was christened in Fermés Church and registered in Yaiza (Lanzarote), but her father’s profession, lighthouse keeper, made her leave the Canary Islands when she was only 5 on a tour around the Spanish geography and its beautiful coasts. So they lived in Valencia, Bilbao, and many other cities where she spent many years of her childhood and adolescence. Culture was very important to her family, and this provided her with a most reliable literary basis and a great love for languages. Being 18 she had a command of French, English and she had some knowledge of Latin and could translate from German. Besides, her artistic side went beyond arts; she had stood out in some ceramic works, drawing and painting. In 1926 she met the Paraguayan ceramicist Andrés Campos Cervera in Villajoyosa, Alicante. He was internationally known as Julián Herrería, and she would marry him two years later, and then in 1927 she would settle with him in Asunción, Paraguay, a city where she spent the rest of her life and where she developed her whole career and developed all her achievements. The arrival to this country that would adopt her was no bed of roses and she was rejected by a part of the Paraguayan aristocracy, who considered her as an “intrusive gipsy” and they were against her procedures. However this didn’t stop her from developing a rich artistic and intellectual production. Josefina Plá is considered as one of the main representatives of the Generation of the 40’s, a fighter for human rights and one of the first activists of feminism in Paraguay, dame of the order of Isabel la Católica in Spain among many other distinctions, such as: member of the International Academy of Ceramics, located in Geneva, Switzerland; Bicentennial medal of the USA (1976); Ollantay trophy to the theatrical research, Venezuela(1984); Councillor in the Vice-Ministry of culture in Paraguay; National order of Merit in the degree of Commander in the Paraguayan Government (1994); Golden medal in Fine Arts in Spain (1995); award for her defence of human rights, by the International Society of Lawyers; member of the Paraguayan Academy of the Language, of the Paraguayan History and of the Spanish History; finalist in the contest of merits for the granting of the “Príncipe de Asturias” prize and also “Doctor Honoris Causa” in the University of Asunción (1981); nominated for the award of the “Premio Cervantes”, the greatest award for the Spanish Arts in the years 1989 and 1994, and that of honorary citizenship conferred by the Paraguayan parliament in 1998, among others. 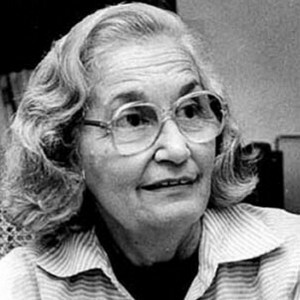 Josefina Plá was a prolific writer, more than 60 published books what with poems, playwrights, short tales, essays, criticisms… she always believed that the best way to renew and enhance culture consisted of knowing how to combine research, creativity and teaching. So she set up the Municipal School of the Performing Arts, where she was teaching for twenty-two years, the centre “Arte Nuevo”, and the Museum “Julián de la Herrería”, and she also took part in the setting up of the Artistic and Literary group “Vy’a raity” (joy nest), whose main aim was that of taking the Paraguayan culture beyond its boundaries. In FuerteCharter, by means of our boat trips from Corralejo, we don’t just want to show you the natural charm surrounding us in the island of Fuerteventura, but we also want to show the history of this little big paradise.